Take a look at this new site dedicated to our Shihan, it is hosted in Japan but does have some English, well worth a look. I came across the attached and have posted it for Sensei Andy. Unfortunately I never had the honour of training with Sensei Kase, whereas Sesnei Andy had the honour of Sensei Kase being his Sensei for many years. This is an open course everyone is welcome, we normally travel on Friday night and return back just in time for training on the Sunday. The cost is usually around £80 for the weekend; this includes a space on Sensei’s floor, meals, training and Christmas dinner. It is a great social occasion. If anyone is interested please let me know ASAP. Shihan Keith Gullen will be undertaking gradings at Selby for anyone that missed out in October. The next main gradings are around Easter, date to be confirmed. We will be having our Christmas photo and display from 5.30 to 7pm. No food this year due to school restrictions, maximum attendance is required for the photo (bring your awards and medals) and the annual presentation of the “Trevor Jinks Cup”. Please bring family and grandparents etc. There will be an opportunity to retire to a local hostilely afterwards for those that are old enough. Many thanks to Sensei Andre Bertel for publishing the interview in The Shotokan way recently. 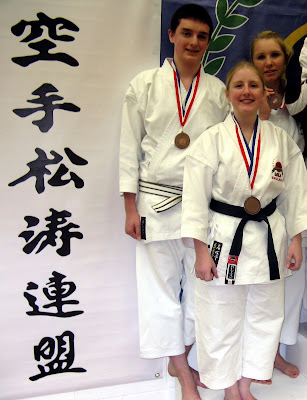 It gives a bit of insight into the IJKA karate-do. Shaun plans to increase the amount of older interviews that TSW publish so keep checking back to his site if you don't already do so. There are links to both sites in the side bar. 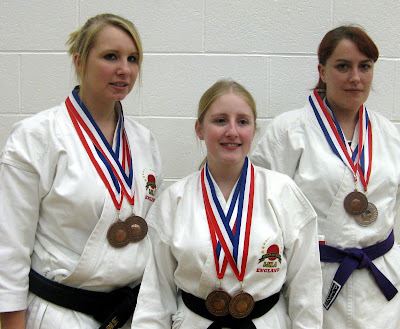 Congratulations to all who travelled from Haxby, Selby and York IJKA clubs to the JKS Open at the weekend. Many thanks to Ian and Bernard for helping out with the judging and table work. If anyone can let me have some further photos I will post them. Many thanks to our hosts Sensei Alan and Scott and for a very warm welcome from all the JKS members, hope to see you all soon. Purely from a table assissants point of view, I would like to congratulate Sensei Alan Campbell and his team for organising an efficiently and professionally run championship. The competition areas were clearly marked and well laid out; the referees and assisstants were given their briefings prior to the commencement of the competition, enabling uniform decisions to be made across the areas; the category and entrants lists were clearly positioned for all to see on arrival; the interlocking mats were a great improvement on the standard 'kick-em and stick-em' mats - shame there weren't more available and, the ongoing results announcements/awards throughout the competition enabled the finish time to be sooner than later, allowing long-distance travellers to get home at a decent hour. Well done to all the Selby, Haxby and York competitors who attended Nottingham, not only the medal winners, and there were a few, but to all those who competed, some for the first time in a national championship, and maybe felt dissapointed with their performance. I wasn't able to see most of the competition, unless it ocurred on area 2, but I'm sure photos and other correspondence will be published in due course. Congratulations once again to the organisers, competitors and, to the spectators/'taxi drivers' who give up their spare time to support their club members at these events. "This year the NOMA team went out to Addis for a total of 10 weeks. We sent out a team for preparation of the the patients 2 weeks before the main surgical team. This included feeding, cleaning & de worming amongst other things! 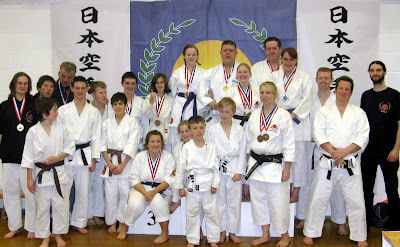 The main team arrived on the 4th October staying until 18th October (so I missed the grading). It consisted of 5 surgeons (2 French & 3 British), 2 anaesthetists, 1 scrub nurse, 1 ward nurse plus, of course, Chris& Terry who run Facing Africa. Using a local hospital we managed to treat over 40 patients surgically, this mainly consisted of children with the effect of NOMA, but we also helped some burn victims, gun shot injuries, some tumours & some post traumatic facial injuries. we even had to amputate an infected hand injury repair someone axed in the face, We also advised on other conditions to help the local medical staff. I was invited to lecture to all the medical staff in Addis. When the main team left a doctor remained or the post operative care as required. Every day was busy as you can imagine but we were kindly taken out each evening courtesy of Facing Africa. Making the trip very enjoyable & a tremendous learning experience. It was quite humbling to see how the patients smile through such terrible adversity. If you haven't seen before the work that Kelvin does with the Facing Africa charity please take a look at the links in the sidebar. "Facing Africa" is a really worth while cause and where hard earned money is spent wisely. If you are thinking of doing something for a charity please consider them.